When I think about what we can accomplish with the AAP I think about some pretty big stuff. It took more then just a government initiative to put a man on the moon. It took an effort of thousands. And the support of millions. For the AAP, our moonshot starts with advocacy which comes in the form of doing as much talking about DSA as possible. Raising awareness among decision-makers is key. It is no longer an awareness about what is DSA (Data Science & Analytics). People get it. Now it is an awareness of how Filipinos can use DSA in their business. I get excited thinking about how the AAP can focus our message as thought leaders and look to continue to complement each other in ways that individual companies could never dream of. We have been actively looking for speaking opportunities to push the message that DSA in the Philippines is of paramount importance. In many ways, even a matter of national security when you look at the threats of Artificial Intelligence, nationalism and political instability… impact OFWS and BPOs directly. The two biggest source of revenue in the country. Outside the core group who have come together to get the association off the ground, we can empower the multitude of interested parties to help too spread our advocacy too. I see us sharing our message of collaboration and the idea that a rising tide lifts all boats across every industry and from all sectors. Big and small, domestic and international, size and scope don’t really matter, we all need more analytics in our businesses. If we get enough key players on board with the advocacy we will have a legit change to actually upskiil train 500,000 Filipinos to be DSA enabled in the next 5 years. That is the moon shot goal I’m dreaming about. Analytics Leadership – DMAIPH is a founding member of the Analytics Council of the Philippines and specializes in arming the Data-Driven Leader with the tools and techniques they need to build and empower an analytics centric organization. Analytics leadership requires a mastery of not just analytics skill, but also of nurturing an analytics culture. We have guided thousands of Filipino professionals to become better analytics leaders. Contact DMAIPH now at analytics@dmaiph.com or connect with me directly to discuss a uniquely tailored strategy to ensure you are the top of your game when it comes to Analytics Leadership. One question I get asked a lot are what are the best skills to master for Data Science & Analytics (DSA) jobs right now? Another question is what skills will be in demand five years from now. With both questions, most of the ones asking are looking for specific applications or tools to learn. Often my reply is that it really doesn’t matter which tool or application you use as much as you get practical experience working with data. My point is that job titles and technical skill sets come and go as technology evolves… what you really need to do is be in a place where your curiosity and critical thinking are continuously challenged. It helps to also be somewhere that encourages new solutions and has a culture that fosters innovation. By no means a exclusive list… if you do a quick search of job posting for DSA professionals you will not find two job posts with the exact same requirements. From where I sit, these are just the ones I see a lot. Here are some of the top DSA skills likely needed over the next 5 years. Again… not even close to a complete list, but you can get a sense of where things are going. Assuming most companies mature past the basic analytics phase and that we continue moving towards AI solutions at the current pace, there will be a lot of new analyst jobs out there with new titles. Data Scientists will be busy solving a wide range of data challenges that currently still seem like Science Fiction today. At least that’s my take as of now. The Augment BPO Data Science and Analytics Advocacy Project (Augment BPO) is empowering BPO Companies, Executives, and Workers in the Philippines to prepare for and address the clear and present danger posed by Artificial Intelligence Chatbots (AI Chatbots) to BPO revenue growth and jobs through Data Science and Analytics strategy planning, awareness building and upskill training. The year 2020 used to sound like it was so far off in the future. Yet, there it is on the calendar… just a little more then 2.5 years away. 2017 is the fifth year of my original five year plan for DMAIPH. Now I’m starting to think about the next big strategic plan and for this iteration I’m gonna work with a 2.5 year plan. Because things are evolving so quickly when it comes to analytics in the Philippines. For the rest of 2017 the big goal is to evolve our public and in-house training options with our partners at Ariva Events Management and the Rock Stars of Data. At the same time we will work in solidifying several key business partnerships with the Analytics Council, APEC Project DARE, BASE (Business Analytics Society of Educators), Data Science Philippines and Global Chamber Manila. There are so many amazing things happening right now in the Philippines that about a year ago seemed to be distant horizon stuff. Its both amazing and a little scary to think where things might be a year for now. Let alone 5. So the birth of the 2.5 year strategy plan is here. By 2017, my goal was to make DMAIPH one of the top names in analytics in the Philippines. Mission accomplished. By 2020, my goal is to make DMAIPH “the” top name for analytics training in the Philippines. Business Strategy with Analytics – Aligning a business strategy to drive an organization forward requires a robust analytics solution. Businesses who have good analytics tend to be much more profitable and efficient then ones that do not. DMAIPH has helped dozens of companies in both the U.S. and the Philippines with adding more data analysis in their business strategy. We have joined up with our key business partner PMCM Events Management to showcase our solutions at #TechToniPH in July 2017. Contact DMAIPH now at analytics@dmaiph.com or connect with me directly to find out what we can do to help you align your business strategy with analytics. In his latest book Data Strategy, analytics guru Bernard Marr, discusses how to profit from a world of big data, analytics and the internet of things. Marr breaks down the importance of having a data strategy to ensure data-driven decision-making, improve business operations and to monetize the data in a business. One of the key takeaways from his book is the emerging role of Chief Data Officer. This is a separate C-Level Suite position form the more traditional Chief Technology Officer or Chief Information Officer as this person should serve as both an analytics cheerleader and data-driven decision-making champion. Big companies have CDOs, but even smaller and medium sized companies need to have someone who acts in this role even if its not an official title. I often say that analysts have to not only analyze data, but be champions of using data for decision-making. They have to be the data cheerleaders to educate, enable, and empower the use of data and analytics across the organization. There are six primary areas a CDO should oversee; (1) high level vision, (2) implementations, (3) data governance, (4) business opportunities, (5) data culture leader and (6) sees data as a commodity. CDOs have to have either a seat at the C-Suite table or the ear of the top decision-maker in the company. They are the ones who make sure that data is properly channeled to the right people at the right time to ensure data-driven strategies. CDOs have to be the one ultimately responsible for data project implementations. This is not an IT thing. IT should be involved, but not the owners of data and analytics. CDO’s have to make sure good data governance is followed. Data has to be stored, secure and accurate. CDO’s are the ones who have the task of discovering business opportunities and identifying risks. They should have access to all the data they need to do both. CDO’s are the ones who consistently and clearly articulate the importance of data and the value of data-driven decision-making. CDO’s see data for its monetary value. Data is a commodity that in itself can be used to not just help the company, but to generate revenue itself. So if you have a Chief Data Officer, or just a chief data geek, you are on the right path. If you don’t have one of these in your organization then your organization are likely going to be left behind. Analytics Culture – The key to using analytics in a business is like a secret sauce that fuels Data-Driven Decison-Making. It is a unique combination of analytics talent, technology and technique that are brought together to enrich and empower an organization. A successful analytics culture is not easy to create, but DMAIPH can show you how. Contact DMAIPH now at analytics@dmaiph.com or connect with me directly so we can build a strategic plan to turn your company into analytics driven success story. I was recently asked how I apply the Four Principles of Marketing to my business. The 4 P’s being Product, Place, Price and Promotion. When I was with Wells Fargo, I spent a significant portion of my time working with marketing teams to help analyze market opportunity, assess market penetration, and to measure marketing campaign success. I learned quite a bit about how to attach metrics to each of the 4 P’s to determine our strategy. When it comes to product, the most common metric is sales. How many products have been sold and how much revenue that translate too is a cornerstone of any business plan. It can be just important though to blend in analysis that is not reflected by internal data alone. Knowing how your product stacks up to the competition and what your customers are saying about your product are much more challenging data points to capture. As for place, the general data point most business decision-makers start with is how much sales activity comes out of a location or geographic area. Place can also be reflected in marketing channel; in-store, direct, online, etc. Decision-makers tie this concept to market place and always look within that place to determine marketing plans. I also like to add demographic data to place to help understand overall opportunity and trends in how the market place is evolving. Price is much more than just what it costs to produce and sell a product. Marketing expense must also be counted in the amount ultimately charged for a product. Price usually contain several components that can be analyzed to make sure price covers expense and allows for profit. Again, I look to competitor data to help assess if the price we are charging is optimal. As a rule, you don’t want to be too expensive or too cheap when your customers have a choice. Finally, when looking at promotion, its more than just where you sell your product and what marketing materials your use. Using the right delivery channel and leveraging your company brand also factor into the equation and should have metrics attached to them. So, as you can see, marketing is more than just counting products sold, finding a place to sell the product, setting a price and beginning a promotion. For a good marketing analytics strategy, that is just the beginning. An effective marketing analytics approach should have at least 10-20 data points to more accurately capture the things you need to know like how big is your market, how competitive is your product, how deeply have you penetrated your market, and what delivery options are the most effective ways to promote your product. The 4 P’s of Marketing can easily be built into a marketing analytics dashboard where you see your key performance indicators and make swift, decisive business decisions. Since setting up my business about 5 years ago, I have helped dozens of businesses get a better handle on their 4 P’s using marketing analytics. Let me show you how we can do the same for your business. Business Strategy with Analytics – Aligning a business strategy to drive an organization forward requires a robust analytics solution. Businesses who have good analytics tend to be much more profitable and efficient then ones that do not. DMAIPH has helped dozens of companies in both the U.S. and the Philippines with adding more data analysis in their business strategy. Contact DMAIPH now at analytics@dmaiph.com or connect with me directly to find out what we can do to help you align your business strategy with analytics. So, as year five winds down and I have reflected on the key metrics I established back in 2012, it seems the right time to add a few more data points to the mix. For me, having metrics that you can measure against progress and use to make educated course corrections is the most important part of any business plan. My first five-year plan was all about establishing myself as one of the top Analytics experts in the Philippines. Based on the number of Filipinos I have trained, the number of Filipino colleges and universities I have worked with and having established a profitable business, it is now time to think about how to expand my horizons. Going forward the goal is not to just have one of the top analytics brands in the Philippines, but to expand that brand name outward. We will expand in terms of both geography and in terms of content offerings. I love new things, so the sky is the limit, but I have these 3 things in mind. The first new metric I will add will be number of trainings with partner speakers. I want to take analytics out of just being for analyst and find ways to use my gifts to empower and educate non analytics people as well. To do this, we will partner with other innovative and progressive minded trainers and speakers here in the Philippines. The second metric will be based on geography. I have given talks and trainings mostly in Metro Manila. On the average I have visited about one province a year to deliver a presentation or conduct a training. Over the next 5 years we will plan activities outside not only Manila, but outside the Philippines as well. I already have one webinar lined up for a U.S. audience in February and will be looking for more places to talk about analytics. Sharing my passion with the world! The third metric will involve revenue. I can’t imagine any business being successful and not having good analytics when it comes to increasing revenue and growing profits. Originally the primary financial metric I cared about was net profit. Could I build a business based on analytics that could generate enough money for me to comfortably live on? Now that we can positively answer that question with a resounding yes, the next question is can we sustain it? When I started, I had one source of income, analytics training. As of now we have revenue coming in from 4 sources of income; analytics training, management consulting, outsourcing and book sales. I need to add at least 3 more streams of income over the next five years to reach my personal goal of having 7 streams of income. The most likely source will be investing in side business that can generate income without my day to day involvement. So, I have just doubled the key metrics I am tracking to measure the success of my efforts. Over the next few years I will monitor the results to see if I need to make more course corrections to get me to the end goal of successfully having executed my second 5-year plan. Stay tuned! It’s going to be even more of an adventure then the last five years! As I sit here enjoying a Big Mac, I have been thinking about WiFi access here in the Philippines. Everyone knows its bad overall. Connectivity is a big challenge for the average Filipino. Although for me it seems better then it used to be. I enjoy the benefit of a Globe postpaid plan now, but for a long time I used prepaid load like most Filipinos do. Its a definite frustration in life. In the past few years malls across the Philippines, have been offering free WiFi but its a crap shoot at best, often down more the it seems to work. To balance load SM malls offer a free hour of WiFi and then you are cut off. This all has me thinking about why it has been so hard to provide better wifi, at least in the malls. It would encourage more mobile payments and help the slow, slow migration away from cash. It could also make the lines go faster. Regardless though, it wouldn’t take a lot of effort to analyze the user data, optimize bandwidth and offer a better wifi experience, especially in the smaller lifestyle malls. It could also be a boon to retailers who offer online promotions to cut back on the number of staff passing out promo flyers as well as the cost of the marketing materials itself. As time passes, I fully expect that to enter mainstream but as of now WiFi in the malls here is not anywhere close to where it has the potential to be. A simple cost/benefit exercise using available data coupled with some usage and capacity analytics would most likely expedite that adoption. At least thats is where I would start if I was consulting with a mall about how to both improve customer satisfaction and drive more retail profits to electronic models. Thanks Bam for the topic idea. Analytics in the Philippines – The Philippines is at the center of the action when it comes to solutions to the global need for analytics. Blessed with a solid foundation of young, educated and English speaking workforce, companies around the world are look for Filipino analytics talent to fill analytics positions. DMAIPH was set up to facilitate these solutions and bring the talent and the business together. Contact DMAIPH now at analytics@dmaiph.com or connect with me directly so we can help you take advantage of this unique global opportunity. I spend a lot of time in malls when I’m in Metro Manila. Business meetings at coffee shops. Getting exercise why walking to hit my FitBit goal. I see a lot of movies. Malls are where everyone goes. To beat the heat, to meet up with friends, to conduct business, and of course to shop and eat. Given that I spend so much time in malls, I think a lot about the analytics that can take place behind the scenes. Or in many cases, the apparent lack of analytics. Now don’t get me wrong. I love the Philippines. The heart and spirit of the Filipino people is the primary reason I set up a business here. But I do sometimes wonder, how much better things could be in my adopted home if there was more widespread use of analytics in decision-making. The malls are full of great examples of decisions that are pretty much done without much data analysis. At least that is how it appears to me. So in this series of blog posts I will discuss several topics that come to my mind when being in a mall in Metro Manila and how I would go about using analytics to investigate my observations. 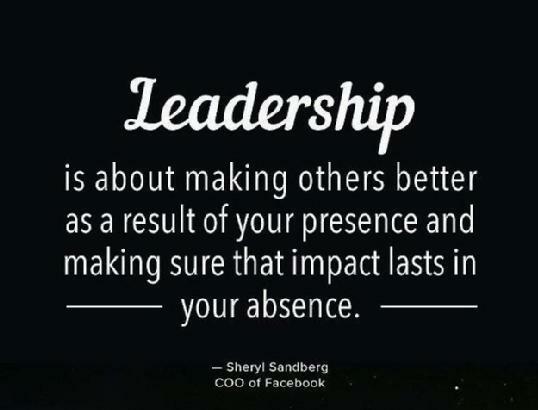 Most of my blog posts the past few weeks have been focused on leadership. As my company grew from 6 to almost 100 in just 18 months we were forced to make a lot of quick decisions that have not always turned out to be the best long term solutions. So now I reflect on those lessons. How to move away from making snap judgments based and move more into data-driven decision making. That’s always been the goal. Here are so of my favorite quotes on leadership and how I plan to wrap them into my leadership meeting next week. Jack Welch said that, “Before you are a leader, success is all about growing yourself. When you become a leader, success is all about growing others.” I firmly believe this and have tried hard to instill this sense of purpose in my leaders. However, we have a lot more work to do before we have an organization full of people looking out for the success of others before looking out for their own success first. A big part of this is to constantly be pushing the organization to evolve and to never rest. Peter Drucker said that “Leadership is lifting a person’s vision to high sights, the raising of a person’s performance to a higher standard, the building of a personality beyond its normal limitations.” That’s my point exactly. We look at the data, analyze our performance and determine what to improve next. From our recent survey, we know our team members crave feeling valued and being appreciated more than they depend on being paid well. We need to focus on this and build a recognition program that show value and share appreciation. Sam Walton once said, “Outstanding leaders go out of their way to boost the self-esteem of their personnel. If people believe in themselves, it’s amazing what they can accomplish.” For us to reach the next level of success as a company this sense of empowerment needs to permeate through the ranks. I hate when I have to manage people because things aren’t being done they way I expect them to get done. Part of that comes from my own failures in instilling this lesson in others. “Leadership is the art of getting someone else to do something you want done because he wants to do it.” from General Dwight Eisenhower. We do too much bossing and not enough uplifting others to dream the same dream we do. And finally, from John Quincy Adams, “If your actions inspire others to dream more, learn more, do more and become more, you are a leader.” To me that is the most important measurement for us to look at. Everything else comes next. Analytics Leadership – DMAIPH specializes in arming the Data-Driven Leader with the tools and techniques they need to build and empower an analytics centric organization. Analytics leadership requires a mastery of not just analytics skill, but also of nurturing an analytics culture. We have guided thousands of Filipino professionals to become better analytics leaders. Contact DMAIPH now at analytics@dmaiph.com or connect with me directly to discuss a uniquely tailored strategy to ensure you are the top of your game when it comes to Analytics Leadership. Analytics is key for any organization to be able to strive for operational excellence and succeed. Looking at how we put these ideas into action, here is what I hope the DMAI team can do. We can continue to look at each business line to make sure its running optimally. Often we focus our energy just on what’s broken, and rarely focus on what’s working. We lost track of the fact that just because its working, doesn’t mean it’s optimal. We can demand more from people. Allowing mediocrity to become the norm is a sure sign we have lost our passion to improve ourselves and our business. We can document more. We can share the documentation more. We can use the documentation as a living, evolving part of the business that will keep things innovative and forward looking. We can set tactical goals. We can reward ourselves to celebrate these successes. And we can use these successes to springboard us to the next tactical goal as we string together success after success towards out ultimate strategic goal. Be the name brand in analytics here in the Philippines. We can constantly promote, motivate and empower each other to strive towards operational excellence and never accept operational mediocrity. We can all get behind the core values of the company, behind our strategic vision and more in unison in our never ending pursuit of operational excellence.